While throwing lines up on one of my "GETYOURAFTINGEARANDDRAWTHISSLAG" images i've been meaning to do which will lead to a bunch of other ones I need to do or i'll eat my hands (something of a catch phrase I use a bit much at times, eh heh), my brother was watching Transformers the Movie (2007) and it was near the end with all the cool Megatron scenes (his growling makes me twitch uncontrollably, take that as you will) and...I ended up pausing a moment and throwing this together. I felt pretty crappy anyway because I haven't drawn anything in the past few days, just dabbling in all ready settled images or coloring, so, this was nice to get out. A little under 2 hours for the whole thing...off and on as I was gawking at the TV and multi-tasking as usual I guess. I love Movie Megatron's design so very much, and one day want to be able to draw him without wanting to go crazy because the details in all the Movie-verse TFs are insane as hell, but arrrrgh...I like the monster side to them way too much. I guess it doesn't help i've been keeping up on some of the info about the new movie, which makes me gleeful as all get out. Oh ho ho Stunticons. And of course, I ended up blacking out his nose some and adding some of those weird...black...cheek things I normally end up doing...and his eyes... though I guess in a way it's hard to tell. Ignore me. This is insanely good! I love the linework and the digital painting along with the red gradients! Holy cow! Oh, that is hot, hot, HOT! You're welcome! 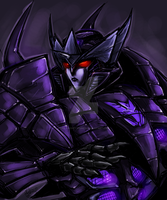 Any hot picture of Megatron is awesome, not matter when it was created. whats the word i am looking for? oh its all hail megatron! lol your picture is amazing its so hard for me to draw transformers epsically megatron. theres so much detail from the ones in the movies. Yes! All Hail Megatron! xD And Transformers at first were hard for me to deal with, it's taken a couple of years to finally get to a point I feel alright with them but always room for improvement. The movie version TFs however are always so friggin' ridiculous. lol i do agree on some of them, but you know its just a movie. I like them none the less!! yeah i am drawing megatron in photoshop and so far it looks okay but its so hard to draw the skeletal machine type from movie version i can show a preview if you like and see what you think. i am not so good at positions. i need to find a position art book to use. I hope you can find a good book that will help you with that then! I've seen some pretty good comic book anatomy books at various book stores and own some myself. Give me the Allspark and you may live to be my pet. I shouted this at the top of my lungs during a watergun fight when I was wrestling with someone over the hose. Because the hose is the fusion canon of weapons, you can devastate anything in your path. And while randomly blasting it in different directions, you can yell maniacally Heavy-TF2 style. That sounds like something I need to do. If I dragged myself out side...but here in Ga, I might combust into flames. Right now it is pouring, and I have 12 hours of school left, AUGHHH. What is this summer of which you speak of? Hehehe, Megatron has a tendency for that reaction. That is probably why much lurve is in his general direction...and fear. Megatron: I'm gonna kill you all! Megatron: Hahaa, just a joke. YOU FAILED! Pardon me while I fetch a towel. --I understand the bit about the growling. Seriously. Movie Barricade, Megatron, and Starscream pretty much render me into a pile of quivering goo. Robotic monsters with sharp teeth? Sign me up. Yeees. It's wonderful! I love the monstrous aspects of them all! No matter what is said of the movie bots, they do fit the bill for a realistic alien mecha beasts imo! Why did you have to make him even more Scary then he already was? Lol, because evil scary is very very very lovely in mein eyes! Hehehehe. I never liked this Megatron version (not like I hate him from TF: Cybertron.. but near ), but you made him so.. nighmarish with all that colors and expression of his face. It's very cool! Hehehehe, that makes me grin. I guess when seen in different looks by others, even some of the more bleh characters to some can come out looking neat. I know quite a few find Movie Megatron pretty garish, and he's one hard monster to get down, but I feel expressions can go a long way, even with snaggle tooth overlords, LOL. Thank you! your blood flows with bad azz. Wow, very scary, yet so Awesome looking! Hehehe, I try! Thank you! Hehehe, it's awesome! Your welcome! Hehe, it is much appreciated!